This week had me more excited than Christmas. I've had several packages from co-ops arrive this week. 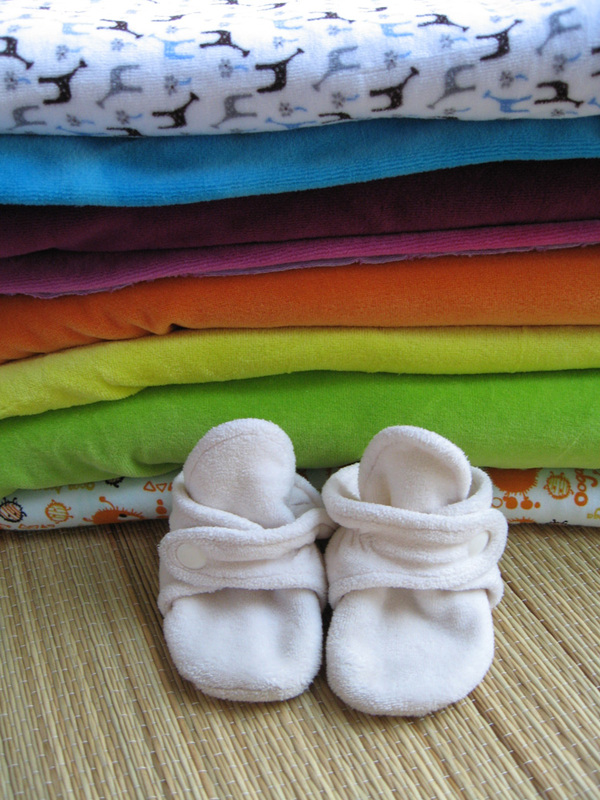 Cotton velour, bamboo velour, bamboo fleece, printed PUL, lastin, snaps... Yes, I'm like a kid in a candy shop. Expect a lot of new stuff hitting my shop soon. I'm really excited to start putting up some of those nice booties (and making some more for Isaac). Moving on, I really wanted to do some tie-dyeing with real procion dyes this summer. Unfortunately, we didn't have any extra money so my plans fell through. But, when all of my new fabric showed up just begging to be dyed and since we have a little bit of money to spare, I figured it was time. 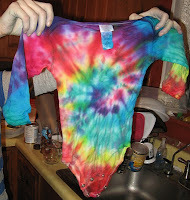 Instead of buying the dyes I wanted to from Dharma Trading Company, I just bought a cheap tulip tie dye kit from JoAnns. It worked okay, but I still would like to invest some money into some nice vibrant dyes. Eve was SOOOoo excited to dye a shirt. Literally jumping up and down for about a half hour. I did the tying and she did the dying. I think she did a SUPER job. As you can tell it faded a lot after washing it. 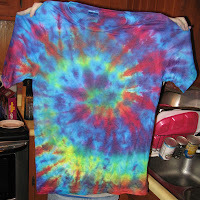 We even used a 100% cotton shirt, and let it soak for over 12 hours. 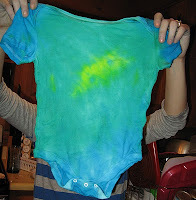 I'd really like to use professional quality dyes next time. 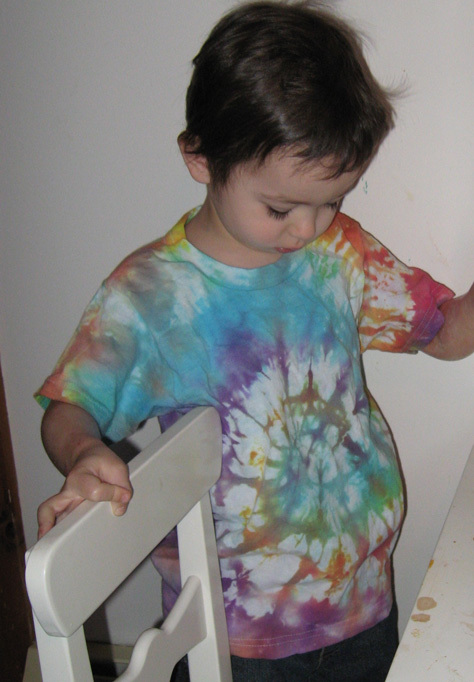 Elijah needed some help with his, so I guided his hand as we dyed it. Of course, I did the tying. As you can see, his faded a lot too. 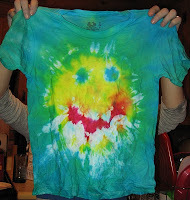 The happy face was a spur of the moment idea I had when I was tying the other ones. 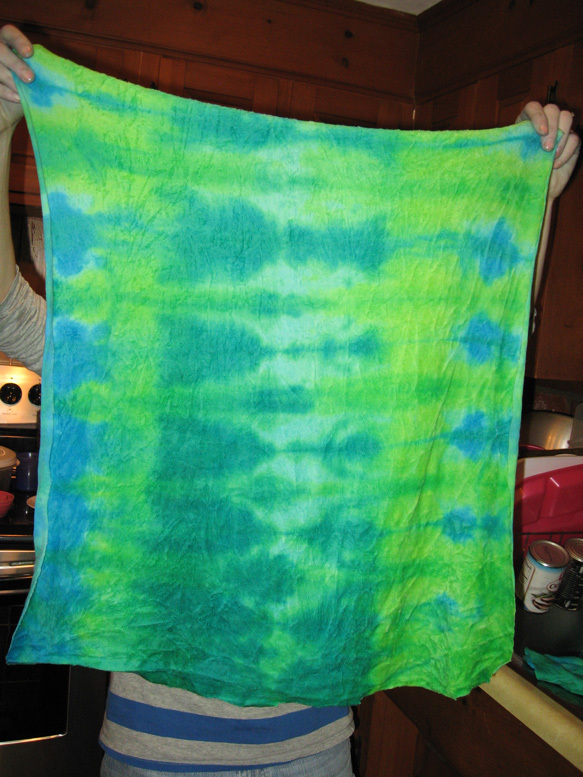 I dyed the mouth and eyes and Eve dyed the yellow, and Elijah and Eve did the blue and green on the outside. I kind of wished I had helped with the yellow a bit more. I'll try to get an 'after' picture up later. This one is mine, and I'm super disappointed with it. 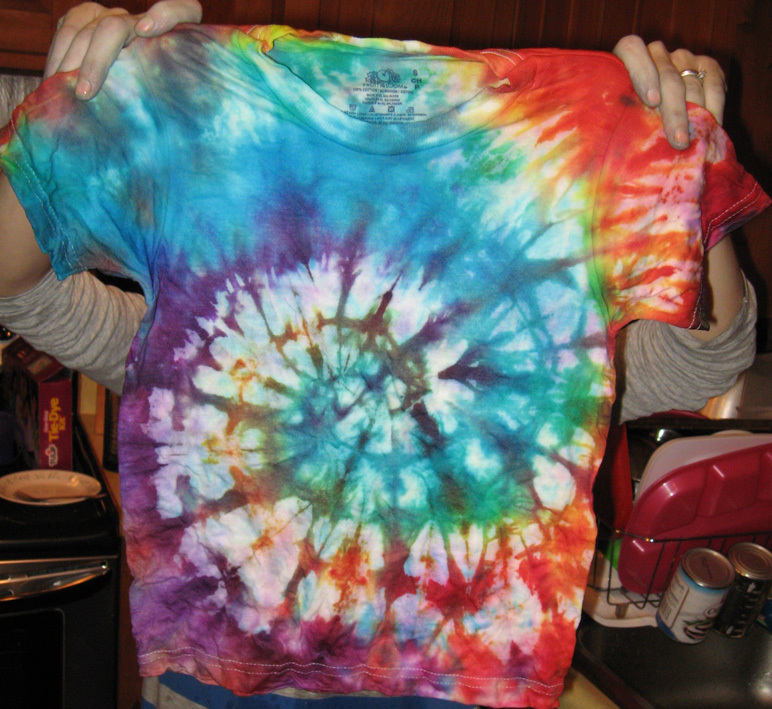 I really liked it in it's unwashed state, as seen above... but I failed to notice that the t-shirts sold in JoAnns (right next to the dye, mind you) are 50% polyester, which gave some crummy post-wash results. Bummer. 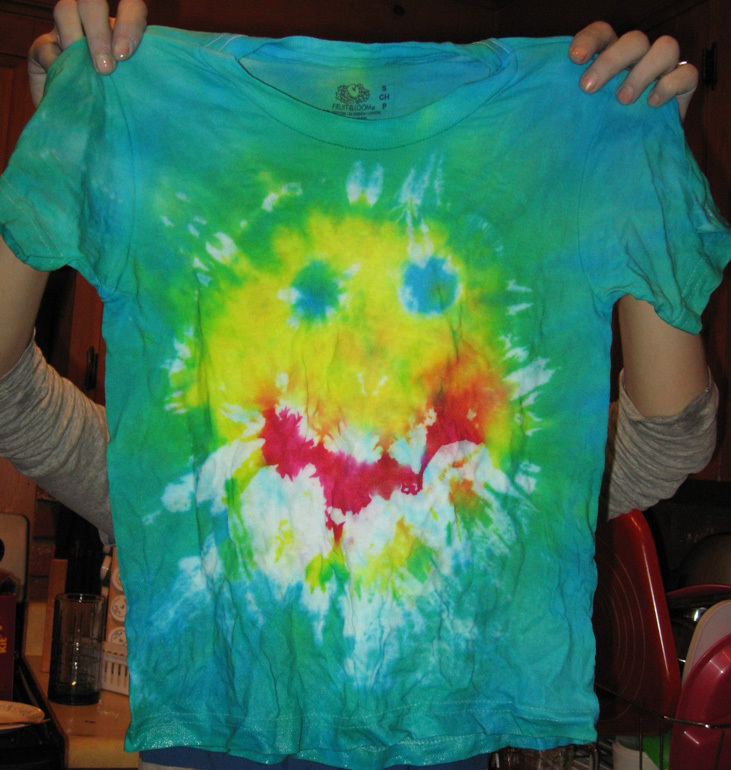 At least I'll have a new PJ shirt. 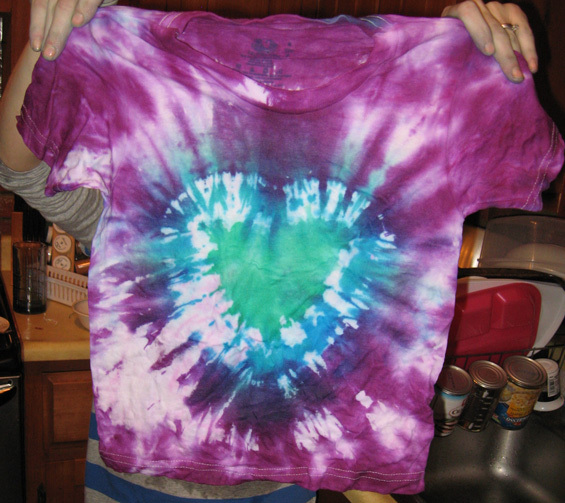 These are Issac's shirts. The spiral came out well, but I failed to notice a couple stained spots on it (it was an old onsie we had) and those spots dyed oddly. The second is a lightning bolt. It surprisingly looks like a lightening bolt in that picture... but I don't think it looks so good in real life. Both faded about as much as the kid's shirts did. 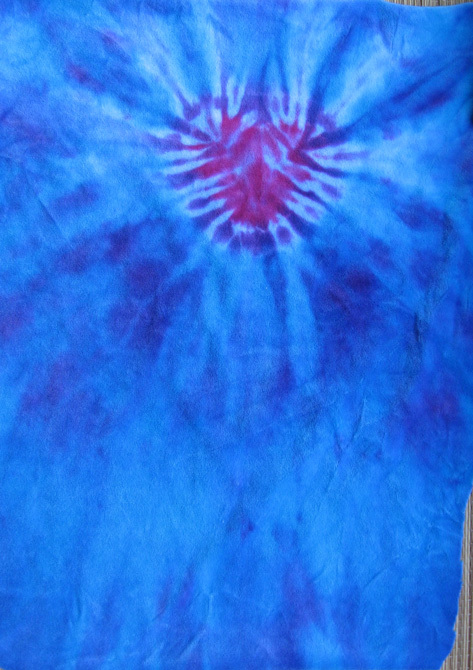 These are some of the velours I dyed. 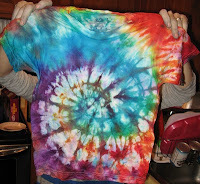 They dyed very well. The color looks great. In the topmost picture of this post, the blue and pink velours are also ones I hand dyed. These two right here are diaper cuts and will be made into fitted diapers to put up for sale on my site. 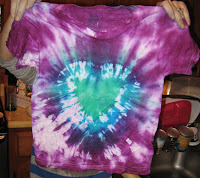 The heart is actually in it's post-washed state, and the color still looks awesome! It's been a while since I posted.... and by a while, I mean I now have a 3 month old I wasn't even pregnant with the last time I posted. Welcome baby Isaac! Anyway, I wanted to start posting again. 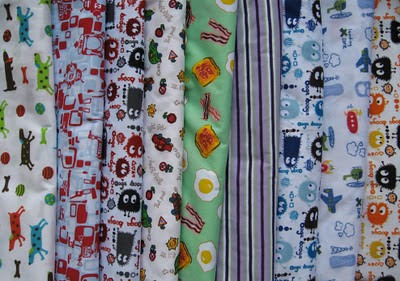 I got a few big boxes of fabric from co-ops I wanted to show off and, well, I spend a lot of time nursing in front computer, so why not? 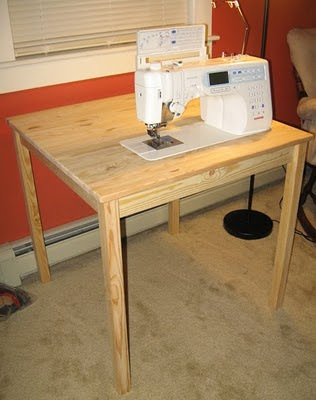 This post will be a continuation of my last post, more about my sewing machine. I knew I wanted to have a sewing machine built into a table, but I didn't want to put out a ton of money for a custom sewing table. So I started looking for a nice cheap table, and I found the perfect one at Ikea. It was on sale for about $35, and was perfect for this project. I don't think they sell the size I bought anymore, but they do sell one a little bigger, found here. I was tempted to buy the bigger one for extra room to the side (very useful), but since we move a lot, I figured it'd be better to keep it small & cheap. You can follow these instructions for either the small or large table. 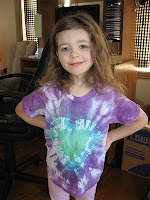 Enough talk... here some pictures and instructions. 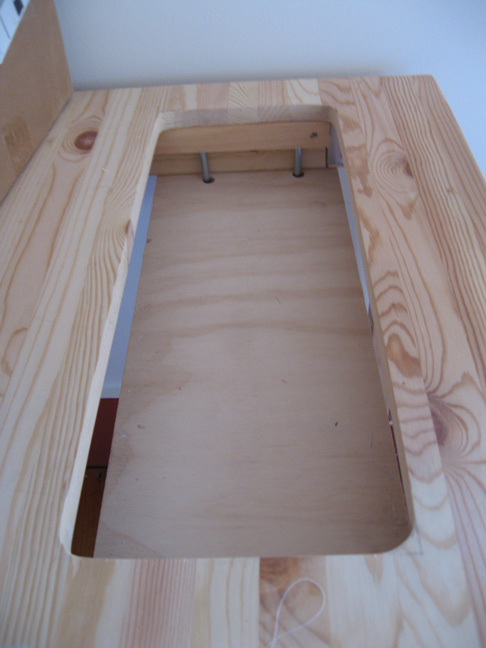 Tools: drill, hand saw, (miter box optional), jigsaw, coarse and fine sandpaper. 2) Assemble it up to step 3, pretty much everything but the legs. 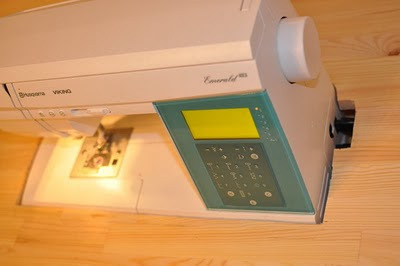 3) Pencil the shape of your sewing machine on top. Leave enough room to the right about to fit the support board (about 2.75" from the edge). It's personal preference how far back you put the machine, but I like to have the needle 8.5" from the front edge. 4) Use the jigsaw to cut out the shape and then use sandpaper to sand the edges. Test with your sewing machine to make sure it fits in and out (it should be snug, but you shouldn't have to fight to get it out). Keep sanding with coarse paper at until you get it just right , then smooth it down with fine paper when you get it to size. 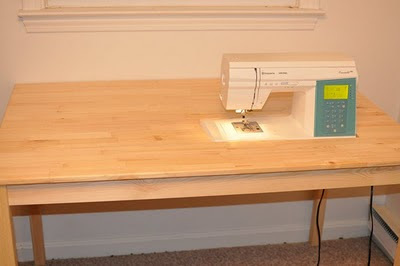 5) Cut the strip of wood the length of the space under the supports of short side of the table. 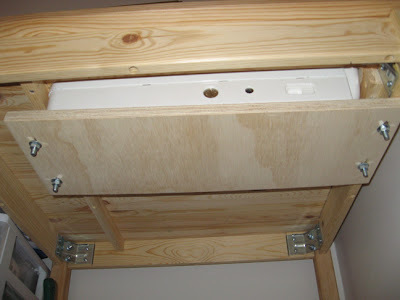 Drill holes for the bolts to sit. Also drill sink holes for the head of the bolts. This is a good time to drill though the long solid wood board too. 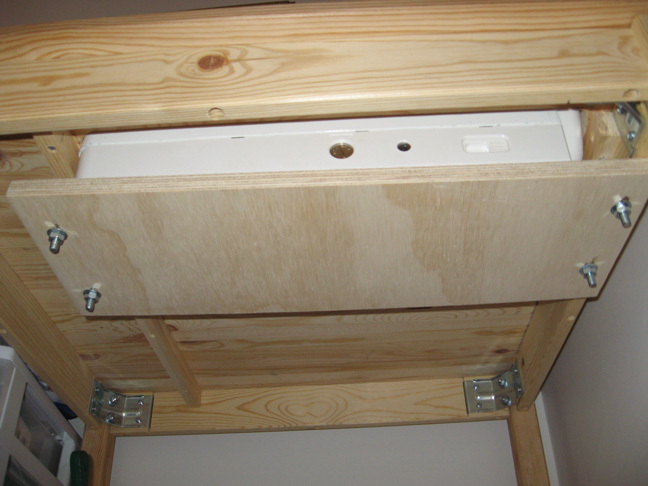 Place the bolts in the holes. 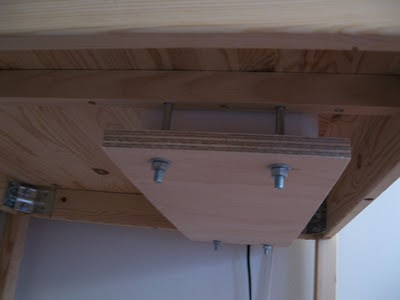 6) Drill sink holes for the wood screws on one board so the screws will reach into the top board, but not go through it. 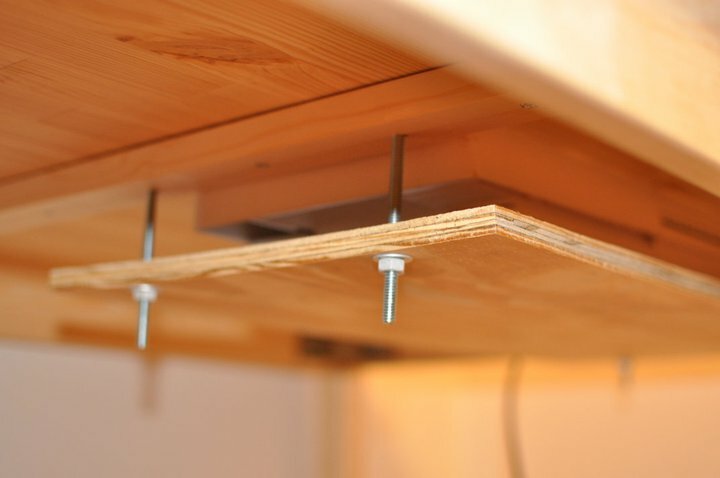 Drill all the way through those holes with a small drill bit for your screws. The other board can screw into the side without sink holes. 8) Place the solid wood board on the bolts and screw it on. Put your sewing machine on the board and raise it up so that the machine is flush. It's a good idea to put some duct tape or bolt caps on the bottom of the bolts if ever think your legs will hit. I didn't bother, my legs don't even come close. Hopefully the instructions helped. I know they're not terribly clear, but at least it's something. If anything, just study the pictures and you should figure it out. Good luck! Here's my friend's table she made following these directions. She used the larger INGO table. I love all the room she has to the side to work. I would recommend a bit larger diameter bolts, but she has a lighter machine and these seem to work so far.